Ampère was born on January 22, 1775, near Lyons, France. He was a prodigy, achieving a high level of mathematical proficiency by age 12. The French Revolution disrupted his teenage years, and in 1793 his father, a wealthy city official, was guillotined by the French Republican Army. 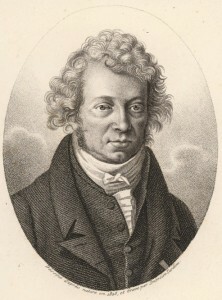 In 1802 Ampère was appointed to two science professorships, in Bourg and Lyons, during which time his research revolved around the mathematics of probability. He became a mathematics lecturer at the École Polytechnique, Paris, in 1805, and four years later was promoted to professor. In 1808 Napoleon recognized Ampère’s talent and appointed him Inspector General of the country’s recently overhauled university system. From 1805 to 1820 Ampère studied psychology, philosophy, physics, and chemistry, and taught in various disciplines in Paris at the École Polytechnique, the University of Paris, and the Collège de France. His investigations of individual elements led him to suggest a classification system based on the chemical properties of elements, a system similar to the periodic table that would be devised independently by Russian chemist DMITRY MENDELEYEV in the late 1860s. In 1814 Ampère arrived at Avogadro’s law (independently discovered by AMEDEO AVOGADRO in 1811), which states that equal volumes of different gases at a given temperature contain equal numbers of molecules. In 1820 Ampère’s attention turned to electricity. That year, the Danish physicist Hans Christian Oersted proved that an electric current generates a magnetic field. Stimulated to conduct his own experiments, Ampère had remarkable results within months. He showed that currents flowing in the same direction in two parallel wires cause the wires to attract each other, while currents flowing in opposite directions create a repulsive force. In 1827 Ampère published his comprehensive theory of electricity and magnetism, ideas that preceded the discovery of the electrical nature of atoms by 70 years. The treatise included what is now known as Ampère’s law, an equation relating the magnetic force between two parallel currents to the product of their currents and to the distance between the conductors. The mathematical relationship between electricity and magnetism was thus established. Ampère called this new field of physics electrodynamics; it is now generally referred to as electromagnetism. Ampère spent his later years theorizing about the nature of electromagnetism. He died on June 10, 1836, in Marseilles, France. Ampère’s contributions to the physics of electricity and magnetism were crucial to our understanding of electricity and its innumerable applications in modern society. The use of his name as the unit of electrical current, the “ampere,” honors his legacy. Oersted’s discovery and Ampere’s experiments of 1820 inspired a cascade of research related to electromagnetism. That year, French physicist François Arago demonstrated that electric current flowing through copper wire enables the wire to attract iron filings as readily as does a steel magnet. Soon Johann Schweigger, a German physicist, constructed the first galvanometer, a device that uses magnetism to measure the strength of an electric current. In 1823, experimenting with solenoids (coiled wires that act like bar magnets when current flows through them), English physicist William Sturgeon invented the electromagnet by inserting an insulated iron bar into a horseshoe shaped wire coil; when an electric current flowed through the wire, the device could lift 20 times its own weight. The electromagnet was improved by American physicist Joseph Henry in 1831. Henry coiled insulated wire around an iron bar, enabling more turns of wire to be employed without causing a short circuit, thus allowing a stronger magnetic field to be generated. Henry’s device could lift a ton of iron. Progress continued with English physicist MICHAEL FARADAY’s 1831 discovery that placing a changing magnetic field near a wire creates an electric current. This finding had a broad range of effects—it led to the development of the electric motor and generator, to the discovery that light is a type of electromagnetic wave, to the invention of radio communication, and, indeed, to the construction of all electronic devices. Posted on March 4, 2015 by Natalie. This entry was posted in Mathematicians, Scientists and tagged electromagnetism. Bookmark the permalink.